No one cares or even notices we’re driving in the wrong direction. We’re officially on Aruba time, where moments are counted in happiness rather than minutes. Cacti and colourful buildings blur together and a reggae remix of Chers ‘Believe’ beats out of the speakers. As I dangle my arm out of the car window the familiar breeze of the island heat warms my skin, and I close my eyes not wanting to wake from this dream. I haven’t even left yet, but somehow Aruba’s got me hooked, I’m urging time to stop, so I don’t have to say goodbye to what the locals, and I now call, the one happy island. One week in Aruba seemed like plenty before I arrived. At only 8km at its widest, and 30km at its longest, this small Caribbean island just off the coast of Venezuela isn’t exactly vast. But what it lacks in size, Aruba makes up for in punch. There is an abundance of natural wonders here, alongside the better-known resorts and casinos, though sadly I feel many people don’t venture beyond their all-inclusive. 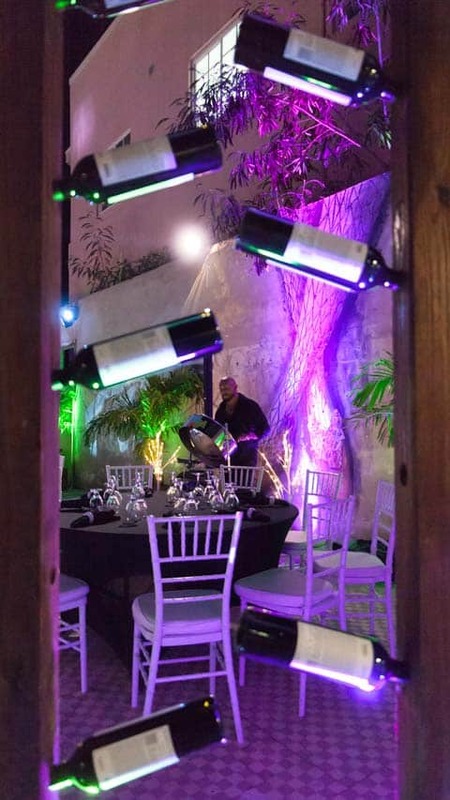 While there is no shame in just taking a holiday, and boy Aruba is the perfect place to do so, for those who want to venture beyond those oh-so-inviting waters and their next cocktail, you’ll be pleased to hear an authentic Aruba still very much exists. 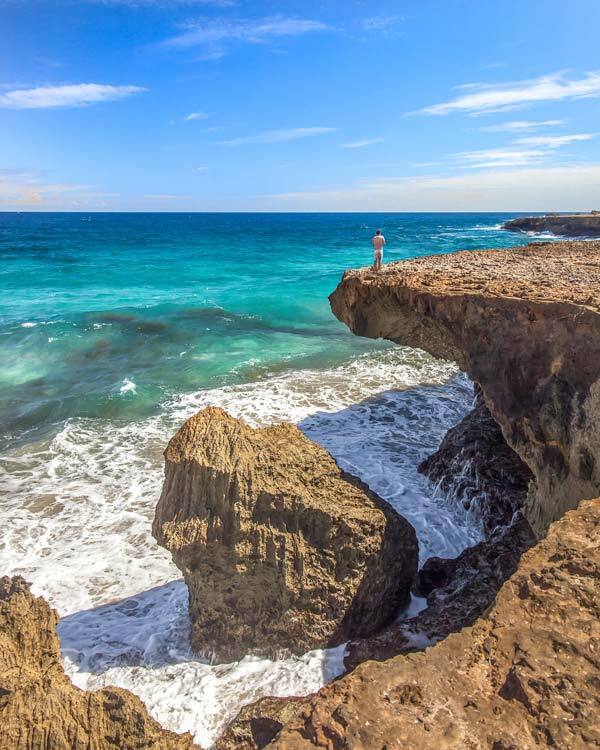 With rugged national parks, incredible stargazing, fantastic local restaurants, near-empty beaches, caves with historical paintings and a thriving street art scene, Aruba is so much more than a sandy feet escape. In this Aruba travel guide, I’ll take you through everything I got up to, or learnt about, during my one week in Aruba. When I was planning my trip, I realised how hard it was to find detailed Aruba travel guides on everything the island has to offer so I’ve tried to compile it all into one place so you can make the most of your visit. Arubus surprised me with the number of routes, and services they have serving the island. While you certainly couldn’t get everywhere, if you combine a mix of public buses with tours you could have a great escape to the island. You can see timetables here. Car hire from the airport is super easy, but I’d highly recommend taking a 4WD over a standard car as this will allow you to access spots in the National Parks and off-road that a standard vehicle wouldn’t. Amigo is a local hire firm who we got our vehicles from. There are plenty of tour operators on the island and transfer options available which may be more suitable for those who will mainly be in a resort. I did hire a bike for a bit, which was fun and the island is flat, though in the strong sun it wasn’t ideal for longer trips. 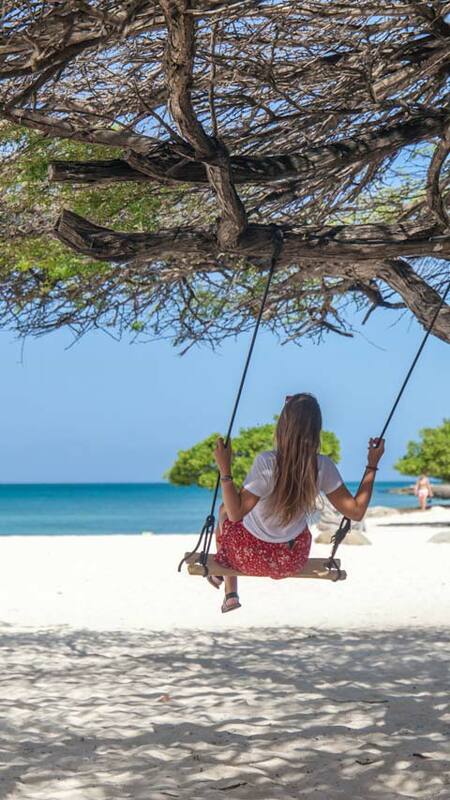 I’ll start with Aruba’s most famous attractions, its glorious coastline which ranges from gently lapping waves to mangrove weaved beaches and crashing surf. For a small island, you can find a vast array of beaches here. Some with sands so white sunglasses are essential, to those which are littered with cacti. My favourite beach is a short drive south of the Airport, although most things are a short drive in Aruba. Mangel Halto seemed lesser known than many of the other beaches on the island, especially given it is a little way from the city and cruise terminal. 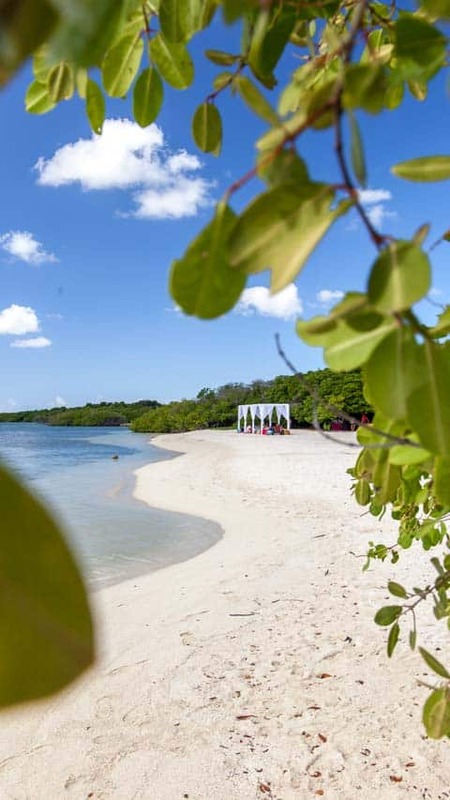 Mangel Halto is a mix of white sands, and mangroves, and it’s also a great spot to snorkel. If you walk along from the beach to the side road, you’ll find a mix of stairs and decks leading straight down into the water. Another of my favourites was Arashi Beach and the nearest to my accommodation at Gold Coast in Malmok. The beaches along here are well known for their snorkelling and with a beer shack and fewer crowds, it was a beautiful place whether in the day or for sunset. The main resort beach on the island is Palm Beach, which is flanked by hotels along its length. While I had heard talk of the ‘high rise’ beach before arriving in Aruba, it isn’t that drastic at all. I had assumed it would be like Benidorm with huge tower block hotels, but it’s still a lovely beach with some of the whitest sand I’ve seen, although a little crowded. At Eagle Beach you’ll find a similar vibe to Palm Beach given its proximity, but not as busy. Here you’ll see swings for that Insta shot, jet-skis for hire, and a lovely restaurant on the sand where I enjoyed lunch. Eagle Beach is also just by the Bubali Bird Sanctuary where you can spot various birds in the marshlands here, so it is worth combining them. At Hadicurari Beach you’ll find a more authentic feel thanks to the fishermen and their huts which are here. If you want to find a similar vibe with a much more deserted feel, then drive over to the east coast beaches on the island, much less frequented by visitors. 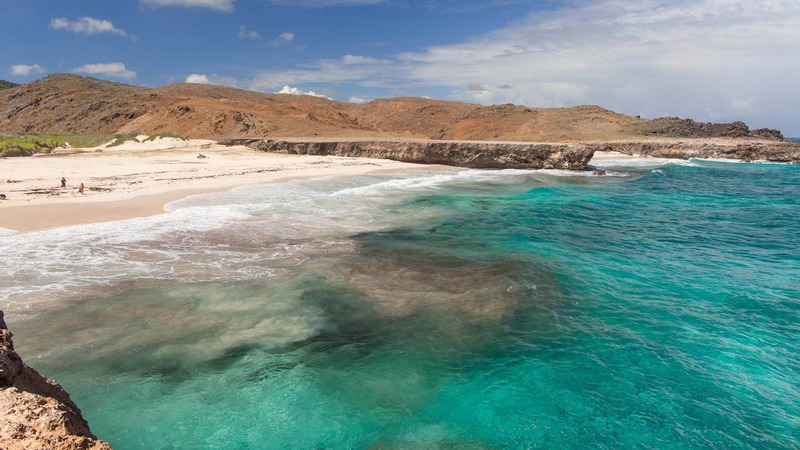 For another sublime beach, with waves crashing against rock faces and water that might as well be photoshopped, head to Dos Playa, the beach inside the Arikok National Park is a gem. If you are anything like me, then lying on a beach is only good for a while before you are restless and ready to hit the water. The water in Aruba is a warm temperature, so swimming and snorkelling are a go-to activity. Snorkel hire is available at many resorts and most of the beaches, except for the smaller quieter beaches that don’t have activity centres. Palm and Eagle beach likely have the most on offer, from jet-skiing to kayaks and SUP. The prices seemed entirely fair here, for Aruba anyway, with costs being around the USD 20 for an hour on a SUP or USD 50 for thirty minutes jet-skiing. 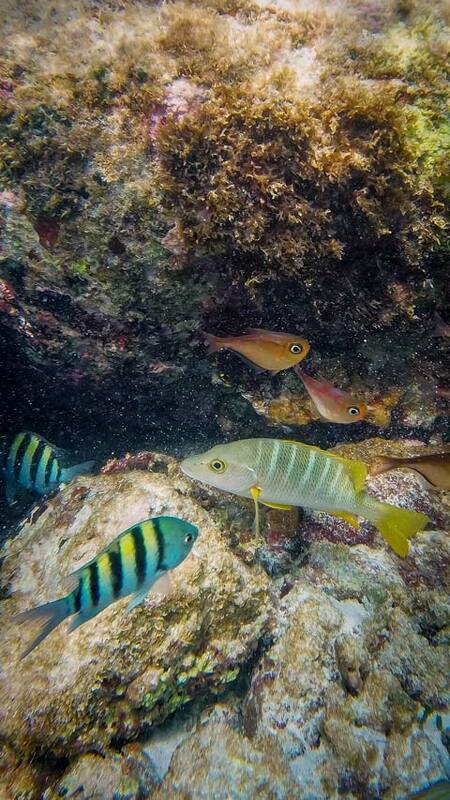 The Scuba Diving in Aruba is some of the best in the Carribean, partly due to its excellent coral reefs such as Mikes Reef, but also due to the abundance of wreck diving. Some of the wrecks, such as The Pedernales which was torpedoed during WWII, are legit wrecks, while others have been purposefully sunk. The difficulty of diving varies between the wrecks so consult with a local diving school which is best for you. One of the most famous, The Antilla for example, requires a boat to get to and although some of the ship is near the surface, the main hull is as low as 18metres. A unique opportunity offered for diving in Aruba is the sunken aeroplane which is near the Renaissance island. Sadly I wasn’t able to dive it on this visit, but it certainly raises the stakes when it comes to wreck diving FOMO. The marine code of Aruba, like most places, means you can’t touch the wildlife. This includes the turtles which you can sometimes find laying, or hatching, on the island as well as underwater life. 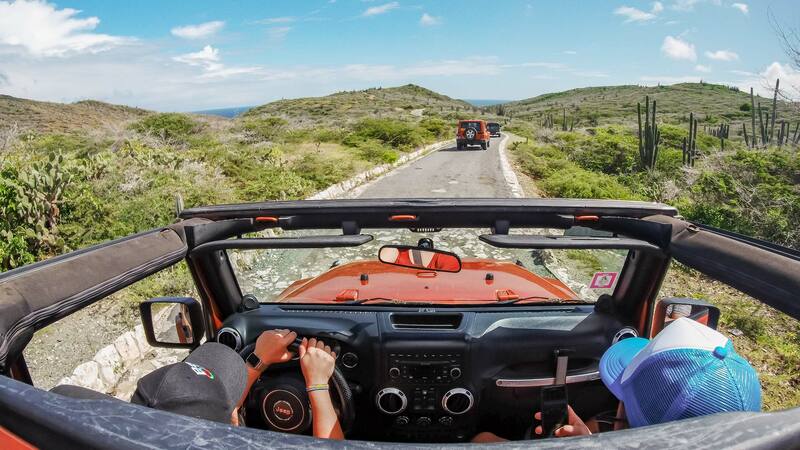 For a small island, many are surprised to learn you can take Island trips from Aruba out to even smaller islands. The most famous is the Renaissance Island, which is private and owned by the hotel which ferries guests from its spot on the mainland to the resort. Non-hotel guests who wish to use the island can try to secure day passes, which are not only scarce but run at around $100 each. The main draw to Renaissance Island are the handful of flamingos which are kept here. Personally, knowing these birds have likely had their wings clipped to keep them ‘prisoners’ for entertainment, I wasn’t interested in going here. 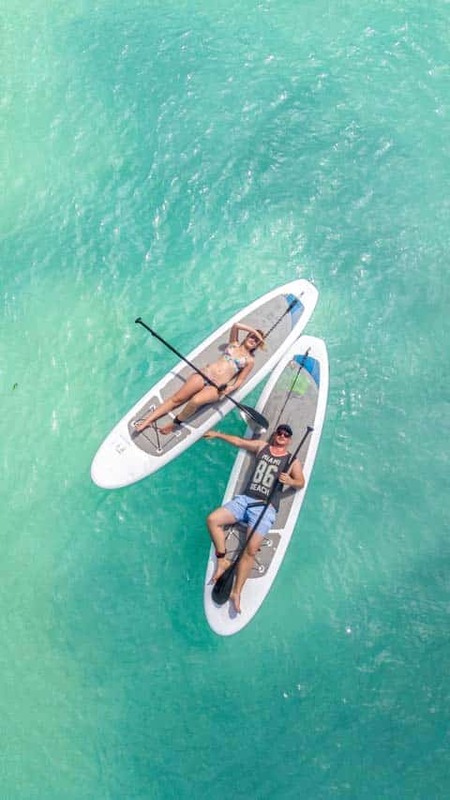 Just along from the Renaissance Island is De Palm Island, another all-inclusive island which has water sports, food, drinks and other activities. 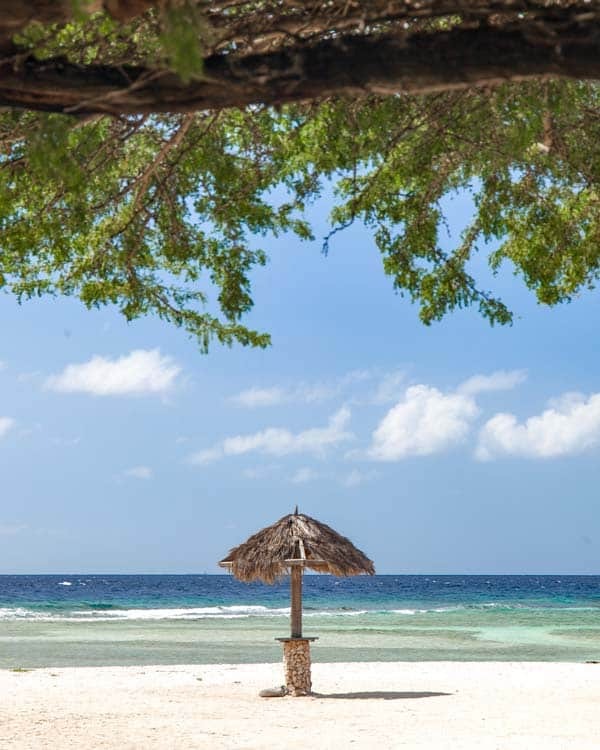 You can purchase tickets for this island online, and at around half the price of Renaissance, you can enjoy the wildlife and escape vibes for less. 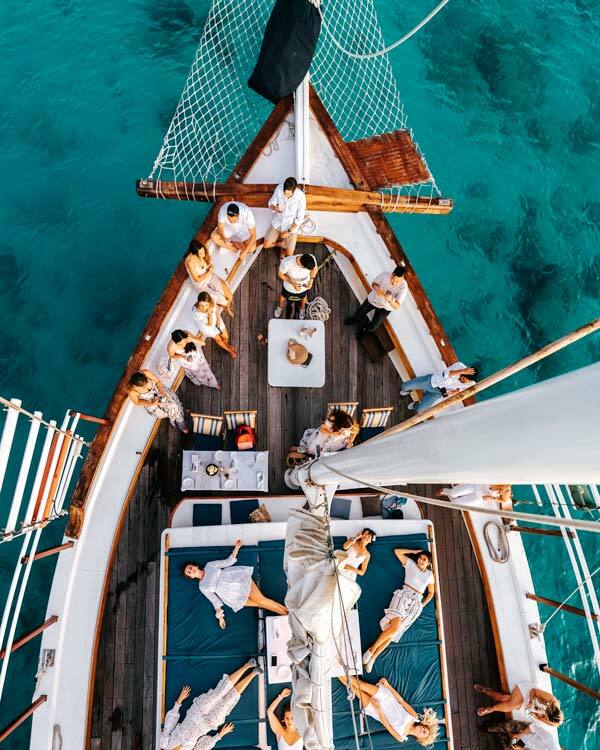 There are also a handful of family-owned reefs and cabins which you can hire, although between the costs of the boat and rental it may only be feasible for larger groups. Our squad had one of the small wooden houses at Barcadera Reef for a morning, and it was really lovely. The local family who owned it made a BBQ possible, and we swam and snorkelled away from the mainland. Most of the resorts and all-inclusive are centred around Palm Beach, and you’ll find no shortage of accommodation on hotel booking platforms here. Aruba is having a bit of a re-think though, and new hotel resorts are less likely to be built in the future as the island aims to limit the amount of development. I would personally suggest to stay away from the big hotels though and look more into apartments and Airbnb. We stayed in the Gold Coast club, which is a mix of residential and rental apartments in the Malmok region in the north. Each came with a kitchen, which is ideal for cooking and cutting costs, and it also has a clubhouse with pool guests can use. Of course, if you plan to stay somewhere like this, a car will be essential. Budget accommodation is lacking in Aruba, with no hostels I could find. That said, there are some homestays and rooms in houses available on Airbnb. 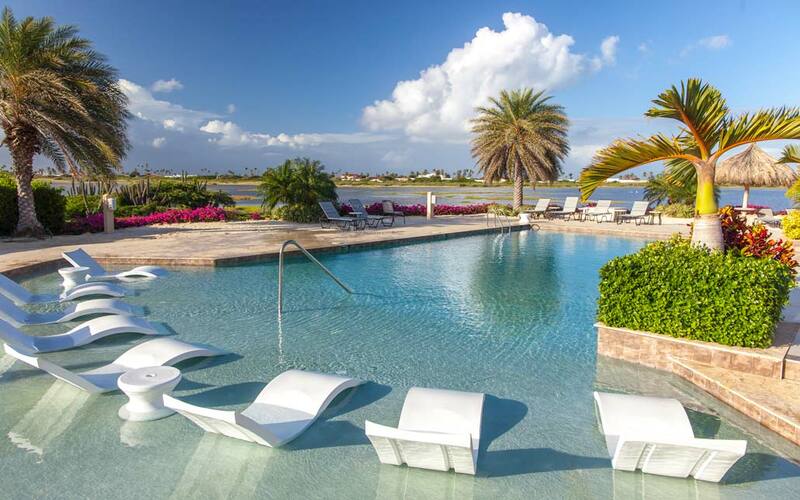 If you want to splurge, places such as the Renaissance Hotel are the most famous, and this also includes access to their private island where the flamingos are. Personally, I wouldn’t want to stay in the central city, or so close to the Cruise Port as when the ships are in, it can get busy quickly. For somewhere a bit more unique, you can actually find Aruba’s only overwater bungalows in Savaneta, the old capital of the island. Covering just over 20% of the island is Arikok National Park. This rugged and dry landscape feels a world apart from the resort beaches on the west coast, but in reality, it is just a short drive. The National Park is home to one of my favourite beaches on the island, the Dos Playa beach I mentioned earlier. During the season, you’ll find turtles nesting on this incredible beach, split down the middle by the dramatic rock formations where aggressive waves crash and create the shapes of the rock. 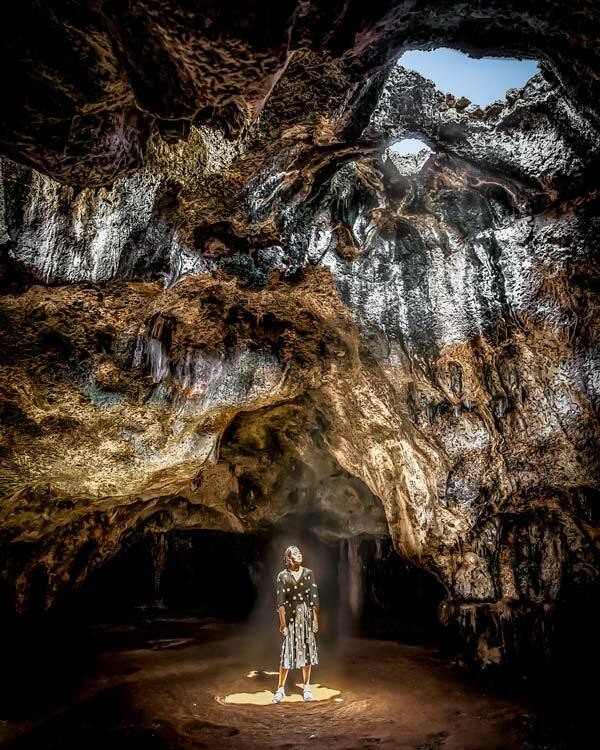 Inside the Fontein cave, you’ll find an ode to Aruba’s long history, thanks to the Caquetío Indian rock paintings which adorn the walls. Quadiriki caves, with their handful of bats and roof windows, provide a cooler temperature to explore and photograph. Another gem in the Arikok national park is the Donkey sanctuary which is free to visit, though donations are of course advisable. Aruba used to be awash with wild donkeys that were imported here, but as more roads were constructed, and thus more accidental deaths, the sanctuary was set up to keep these four-legged cuties safe. 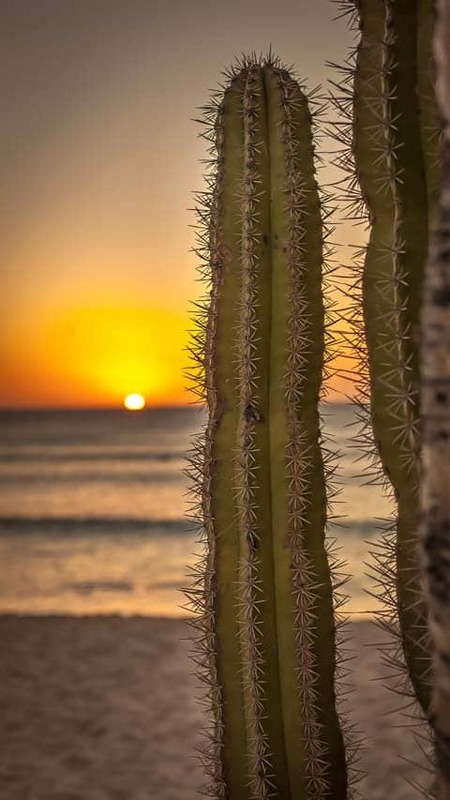 The national park is a mix of sand dunes and cacti as far as the eye can see, and the best way to explore is either with a 4-wheel-drive or by enjoying adrenaline filled buggy explorations of the park. Whether you opt to take a dip in the natural pool or get lost hiking through the landscape, you could easily spend a couple of days admiring all of the beauty in the Arikok national park. It’s no secret that Aruba is expensive, although if you can secure affordable accommodation and flights, once here there are various ways to keep your costs low. Hiring a car is a great idea, and as a small island, your fuel costs won’t be high. Many accommodation options and even hotel rooms have kitchens of some kind to allow people to cook. While the local currency is the Arubian Florian, most places will take USD and even list their prices in them. I found local restaurants, such as Peanuts near the capital, would list their prices in Florian and these places always worked out cheaper. You can enjoy main-courses away from the beach for around the $10 mark while enjoying an outside dinner with your feet in the sand will cost considerably more. 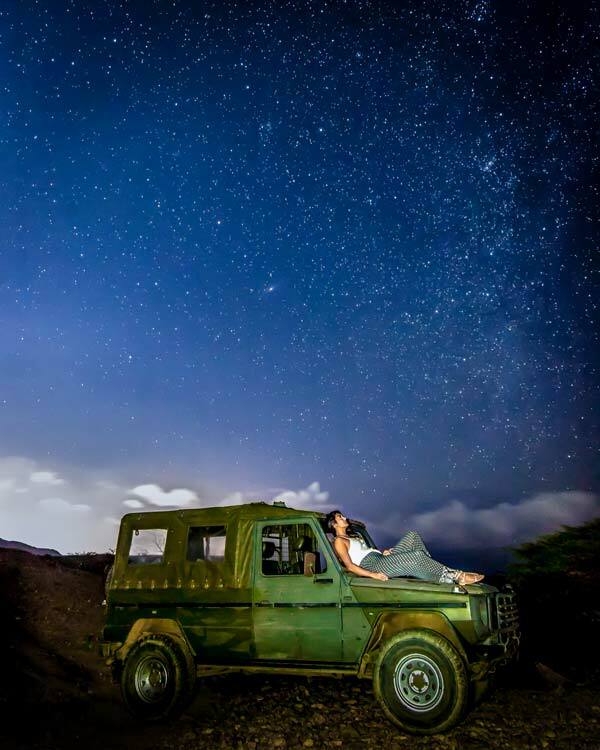 In the Arikok national park, and nearby, is also where you will find some of the best stargazing on the island. 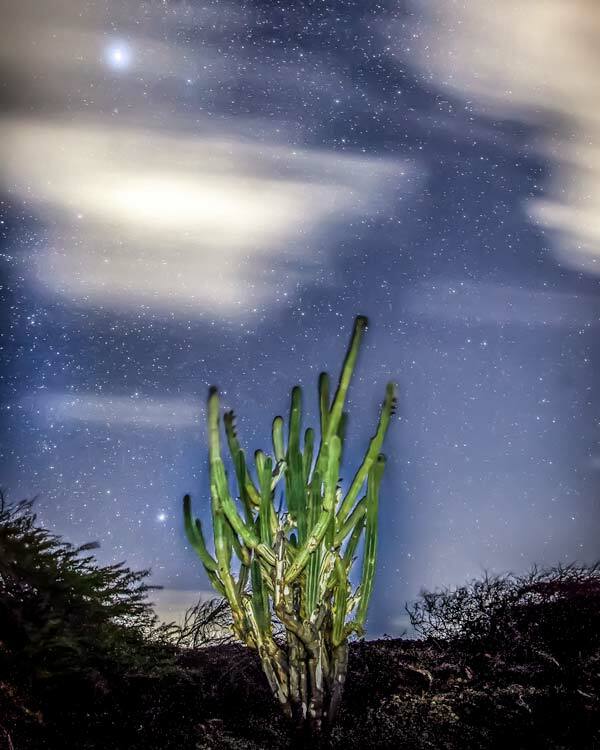 One evening, we headed down the dirt track road (4WD is essential) by the Ayo Rock Formations, just outside the park, and set up under the stars. The night sky was awash with stars, and with minimal light pollution, it was an incredible evening marvelling at the universe. The highlight of my trip to Aruba was exploring the colourful and gritty streets of San Nicolas. Known as the sunrise city, most tourists would venture to the far south of the island to enjoy the pristine sands of Baby Beach. But here, although just a short drive away from the shops and glare of the capital, you’ll find a much more authentic slice of Aruba. San Nicolas sometimes gets a bad write up, and you’ll often see prostitution thrown around while describing it. Thanks to some passionate and dedicated locals, and international street artists though, it’s getting a new lease of life. 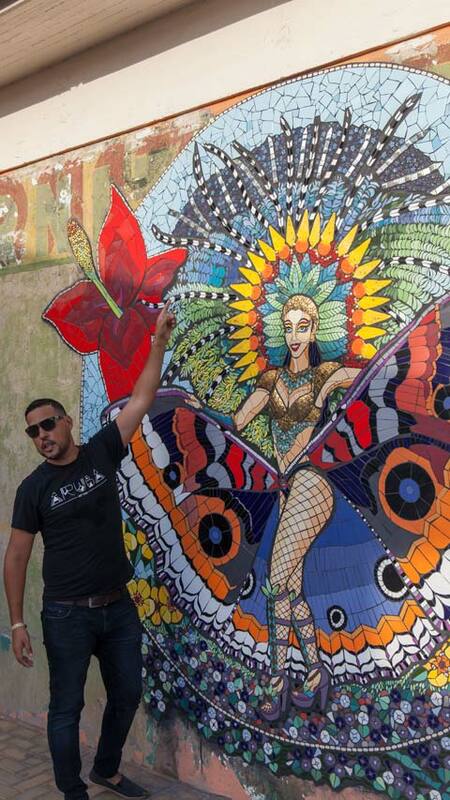 The once run-down streets and dilapidated walls are coming alive as mural artists from across the globe share their work across the city. On each corner, you’ll find another piece of art, whether it be sprayed on the wall or constructed from the island’s garbage. 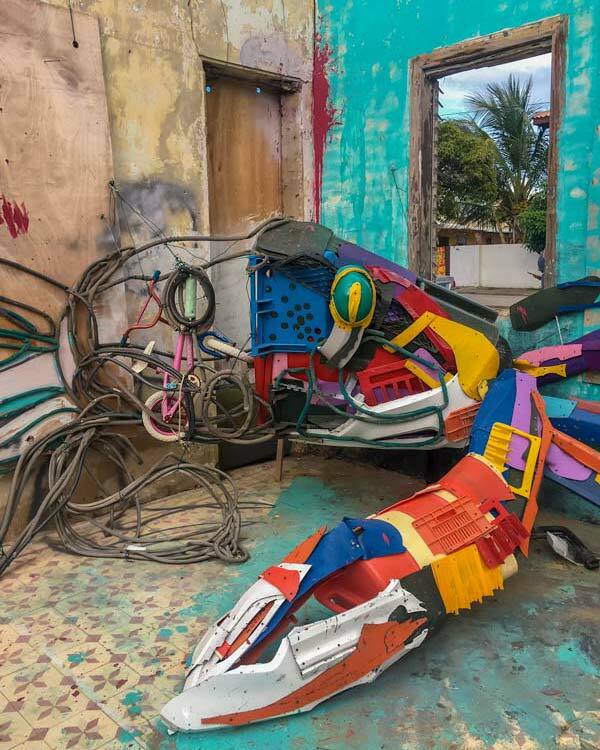 San Nicolas is also home to the newly built carnival museum, paying homage to this colourful and electric festival which occurs from January to March every year. If you are seeking out a more raw side of the Caribbean vibe on Aruba, you’ll love San Nicolas as much as I did. Start your visit at the Cosecha Creative Center, which has led the way in bringing a new lease of multicoloured life to the city. Here you can purchase local artists work, or turn your hand to create your own. I was lucky enough during my visit to meet some Portuguese street artists and leave my mark with a can of spray paint on the newest mural in town. If you time your visit right, steel pans will echo across the streets as flamboyant outfits dance around you in a whirlwind of colour. Here, in San Nicolas, was where my heart really came alive. Each Thursday you can sample the flavours of the festival here in the city, with music, shows and handicrafts bringing the streets alive. 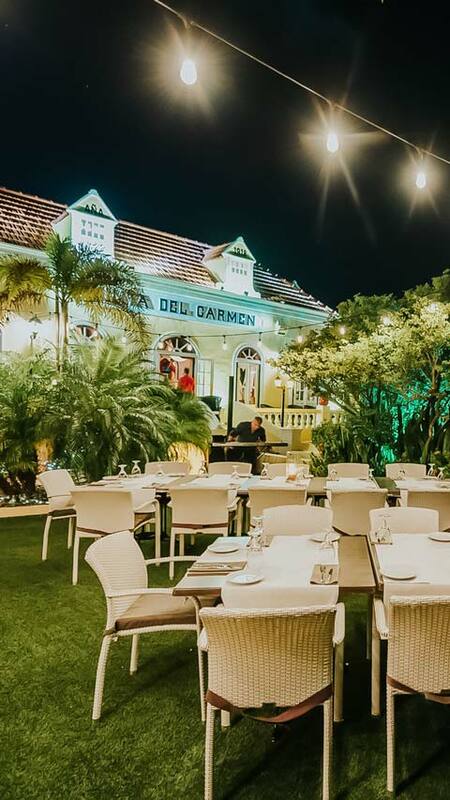 Keep an eye out for pop-up events here in the form of outside street restaurants, which will round off the perfect visit to this lesser-explored side of Aruba. If you are seeking the island’s culture, make sure you come down to the sunrise city. Aruba is just outside the hurricane belt so as a general rule, it is a year-round destination when it comes to weather, keeping a temperature of around 28 degrees throughout the year. The lower seasons is September – November when the weather can be slightly unpredictable, but the costs are usually much lower to visit. 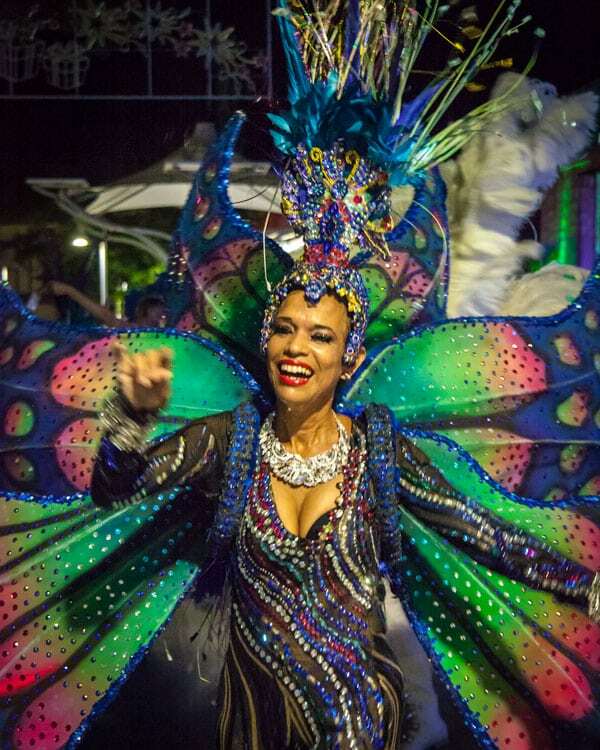 From January through to March, the Aruba Carnival takes place which is a huge event attracting many visitors. While this would be an incredible time to visit, be sure to secure accommodation as far in advance as possible if you want to join the party! 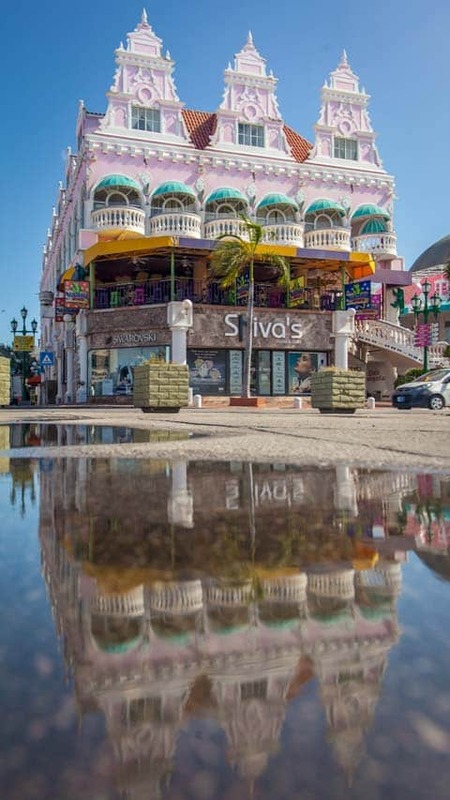 Oranjestad is a city stood in the middle of time, from the old colonial buildings to the modern cruise port, here you can gamble at a casino or explore the historical monuments of the city. 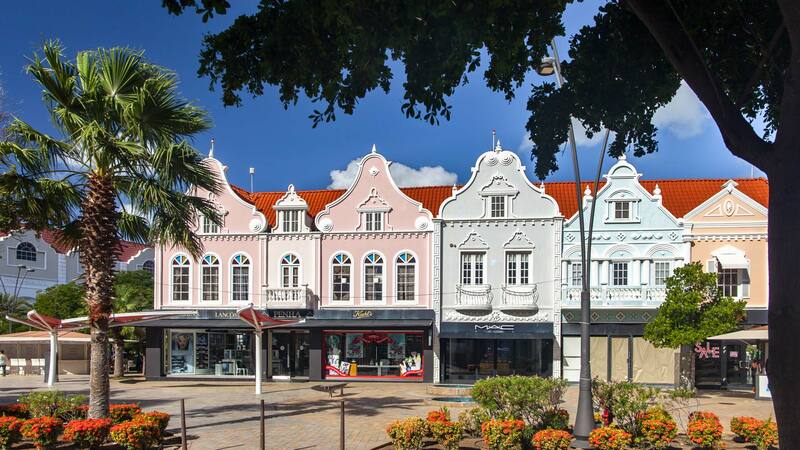 One of the best ways to get a feel for Oranjestad is to join a walking tour, and I highly recommend doing so on the evening version with Aruba Walks. Exploring the city with two friendly locals, our group was guided between the most important historical monuments in the city, complete with stories of the history. The bonus of this particular walking tour is the foodie element, with five different restaurant stops being included. We sampled food not just from Aruba, but also Cuba, Dutch and Spanish; each one contributing somehow to the story of the island. The three-hour tour was a perfect introduction to the city, but leave the car at home if you plan to enjoy the drinks served up during it! The first thing that will strike you when you arrive in Oranjestad is the colourful, and dare I say garish, buildings from the Dutch days. Bright pinks contrast against cheap shop signs, while more pastel shaded houses are pleasant on the eye. 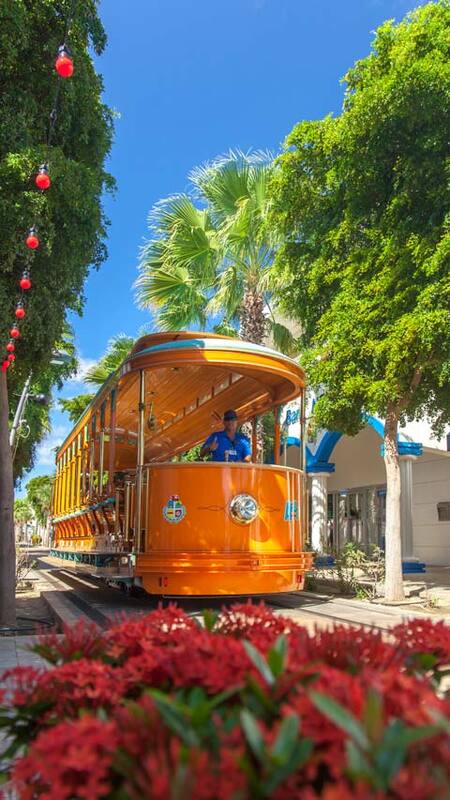 The free tram, which circles the city, is another excellent way to get your bearings and take a lazy loop of Oranjestad. If you are in the mode to drop some dosh, you’ll find plenty of high-end retail stores on the squares and in the malls here, alongside the more typical tourist takehomes. It’s also a hub of nighttime entertainment, although most of my evenings out were spent around the white sands of Palm Beach. 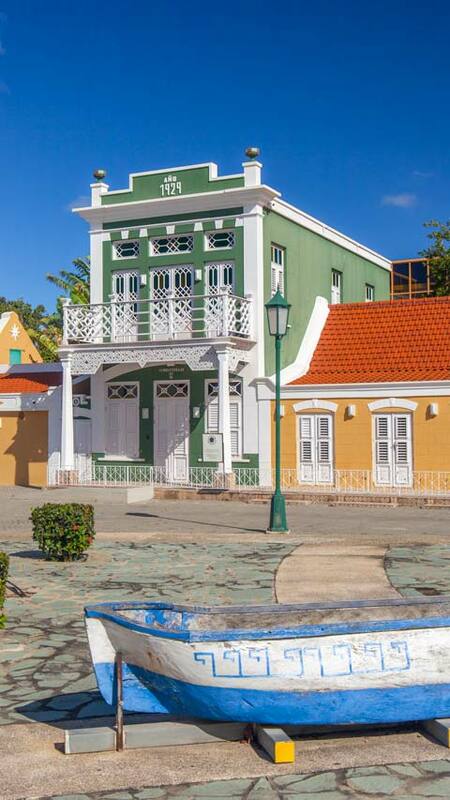 Notable tourist attractions worth visiting include the oldest building in Aruba, Fort Zoutman. The tower next door followed in 1868, and both were used to protect from pirates. Now you’ll find the Historical Museum here which will give you a good overview of the islands life. The area that Oranjestad covers used to be known as the horse bay, as many horses were imported here over the years to run amok. You’ll spot blue horse statues across the capital to pay honour to how the landscape has changed here. 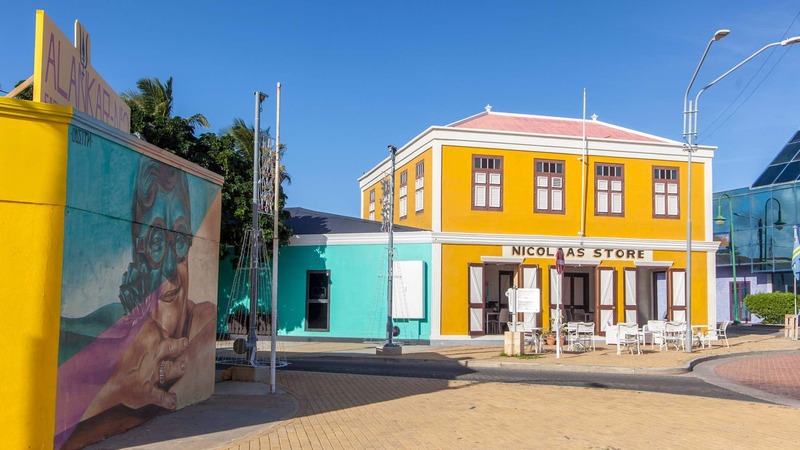 If you want to sample some culture in Oranjestad, you can either head to the community art centre, or enjoy a performance at the countries theatre, the Cas di Cultura. The capital is compact, so exploring on foot is your go-to here. Park up the car, though be aware if it’s a busy day in the port for cruise terminals the capital can quickly become very busy, so head here in the mornings, and you’ll be luckier with both parking and the crowds. 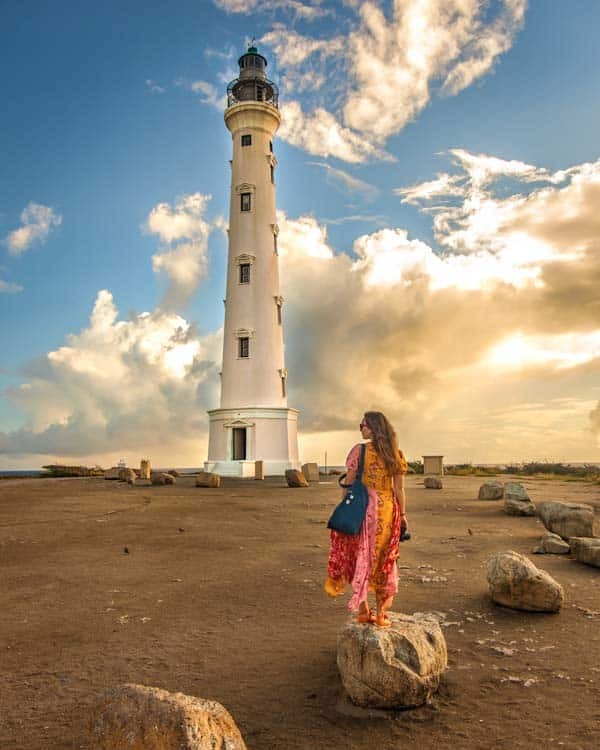 While there are plenty of ways to spend your time in Aruba, there are a few attractions, mainly linked to the history of the island, that are considered must-visits on the island. Nearby the Arikok National Park, you’ll find the Ayo Rock Formations, a set of monolithic rock boulders which also have one cave complete with similar historical paintings as the ones found in the national park. 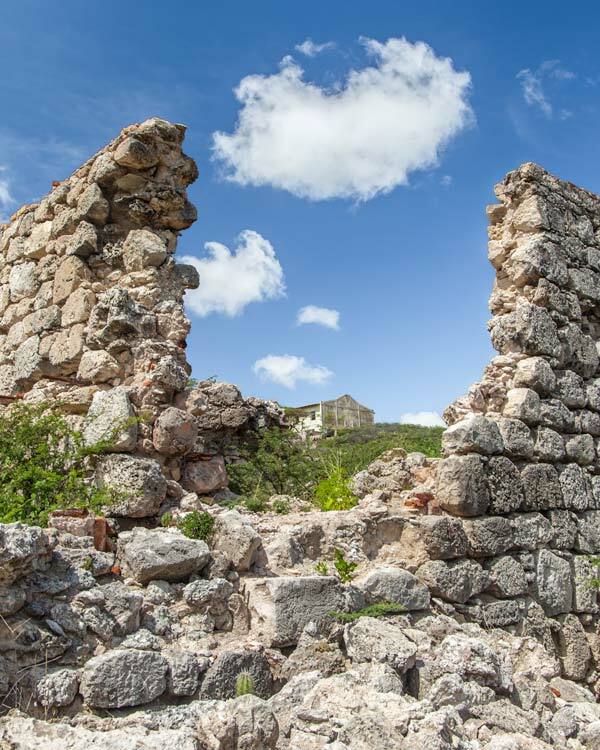 The site of the Balashi Ruins is where you can see how the mining industry of Aruba has been and gone. In the 19th-century gold mining was booming here but now, all that remains are the ruins of the mine which you can wander around by foot and enjoy some aerial views from the top of the site. 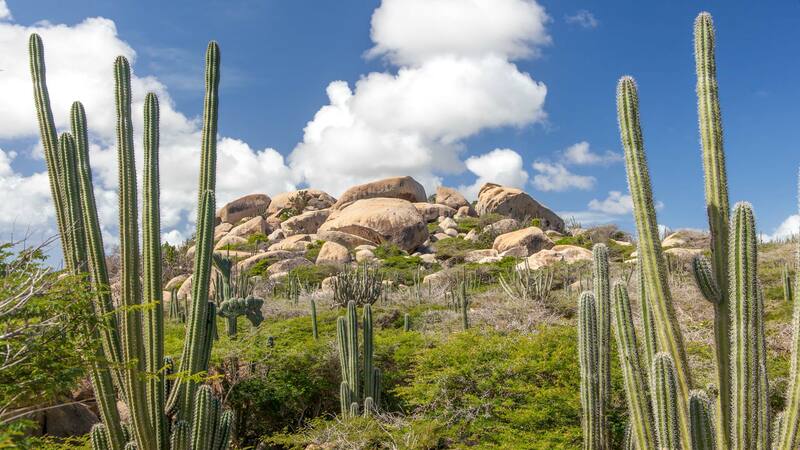 The Caiquetio Indians were the first known inhabitants of Aruba, some 3500 years ago. 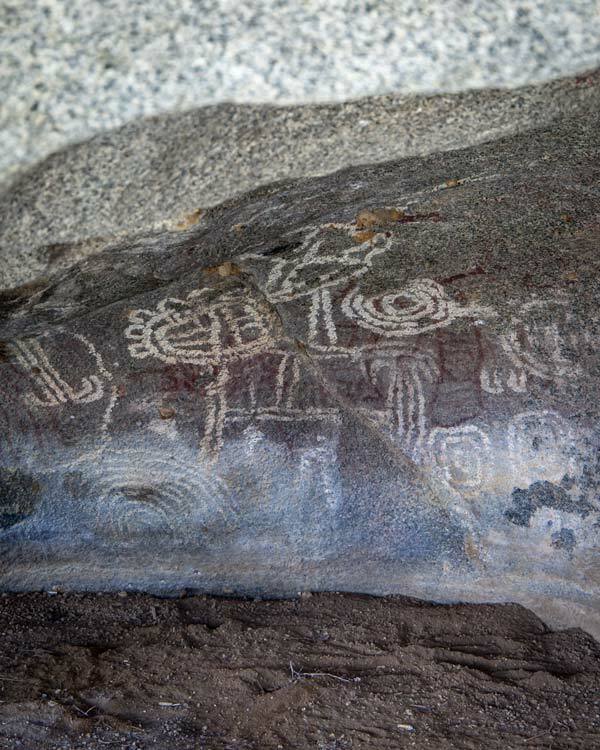 Rock drawings from these days can still be found in the caves of the islands. In 1499 the Spanish arrived in Aruba, which started a chain of colonisation from different countries. Slavery began both on the island and shipping locals away, and for the next 137 years, Spain kept control of the island. Following this, The Dutch occupied the island ever since, although the British colonised it for a period during these years. In 1845 Aruba officially became part of the Netherlands Antilles, which includes two other nearby islands. In 1986 Aruba seceded from the Netherland Antilles, but never became fully independent. It now has an autonomous status within the Kingdom of the Netherlands. For a more detail history of Aruba, visit the Aruba Tourism website. 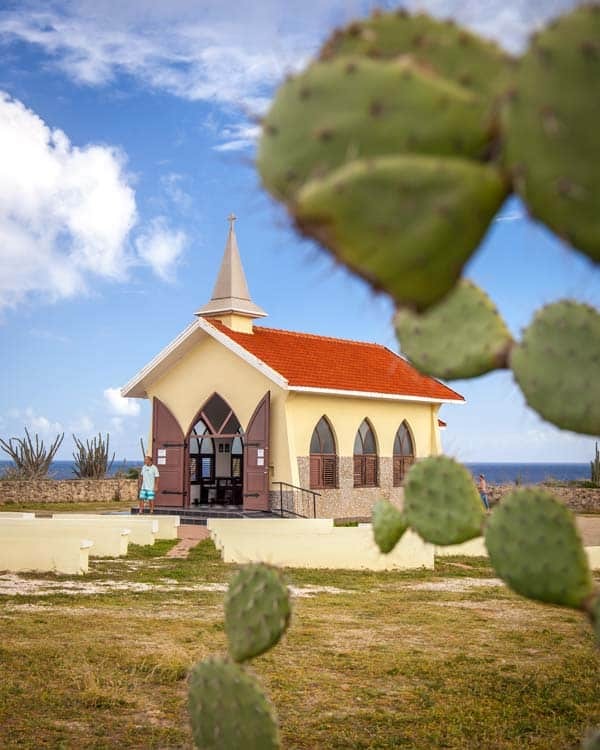 The Alto Vista Chapel is not large, but thanks to it’s slightly raised position it has some great views of the north of Aruba. The original chapel was destroyed, but the current church opened in 1952 and stands at the same position as the first, built by a Venezuelan missionary. The chapel was first constructed here in 1750, and this began the conversion of the islands residents to Christianity. In the north of the island, overlooking Arashi beach is the California Lighthouse. An iconic symbol of the island, the views from the top of the lighthouse are fantastic, though arrive here early in the day to avoid a queue to get in. The lighthouse was named after a steamship, California, which became shipwrecked nearby in 1891 and was the trigger for building the new lighthouse. English is commonly spoken across Aruba, as are three other languages. 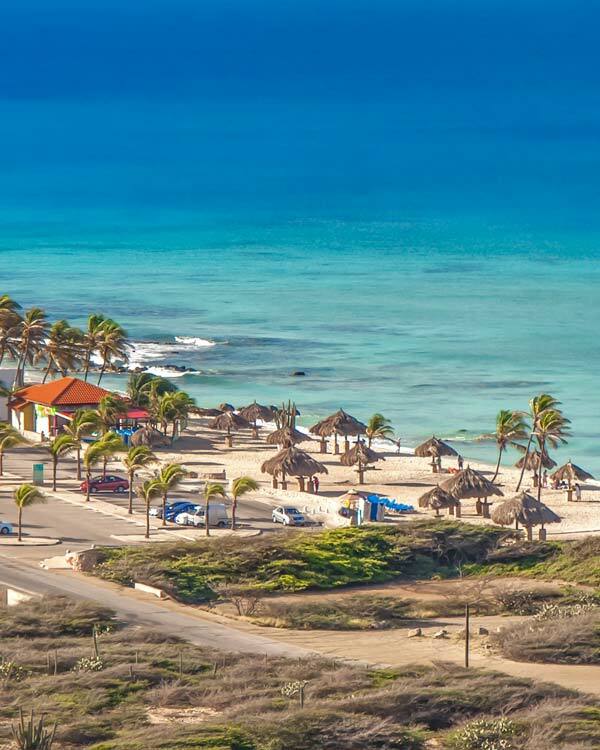 The two official languages of Aruba are the local language of Papiamento, and also Dutch, though most people will also speak Spanish and English at least. 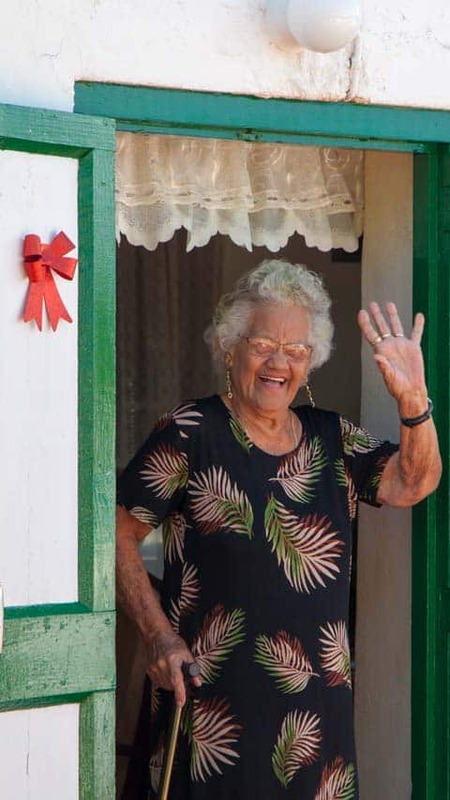 The native language only became the official language in 2003, although it has been in use for well over 300 years. Papiamento is a mix of Duch, English, and Spanish, although its main bulk lays in Afro-Portuguese Creole. 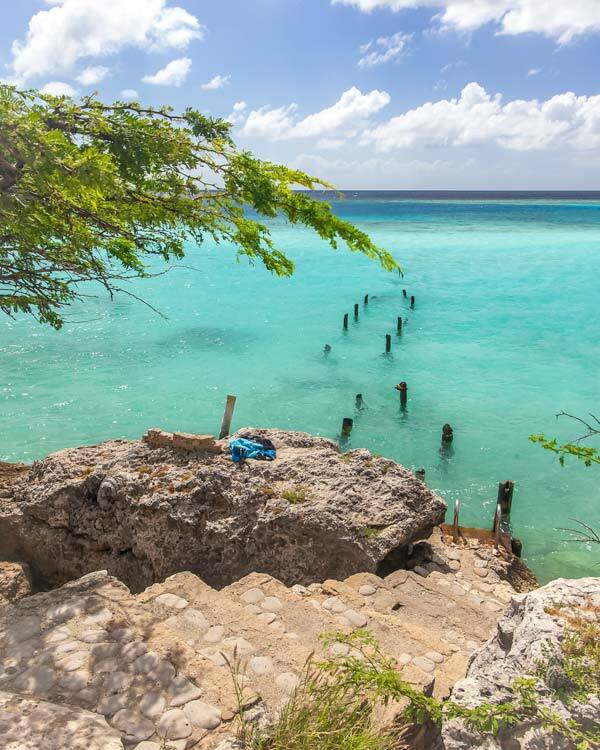 Alongside the scuba diving, water sports, Aruba food tour and maybe taking a buggy tour through the national park, there is one other excursion I highly recommend you do in Aruba. While I wanted this Aruba travel guide to be authentic, there are a few touristy things you simply must do. 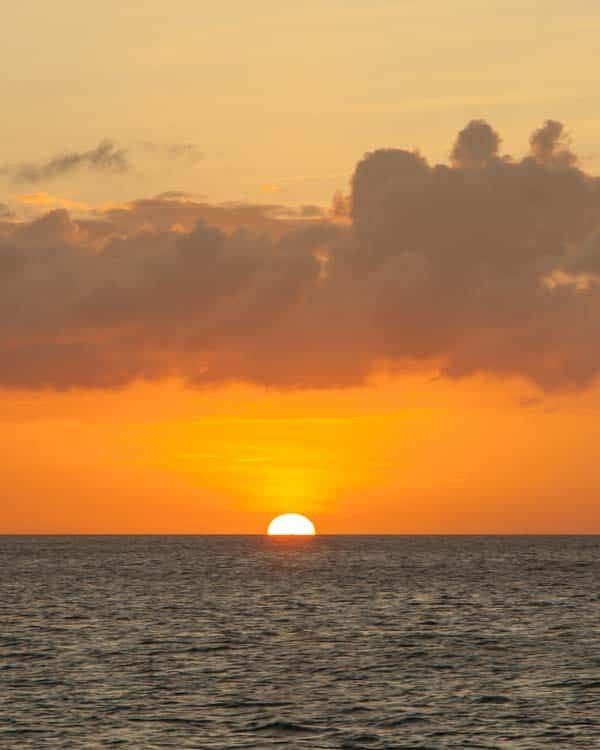 A sunset dinner cruise in Aruba is one of those things, and there are a few different companies that offer these. Some are more booze heavy, others, like the Monforte Luxury Dinner Cruise we took are more focused on food and entertainment. Setting off to watch the sun dance its final moments of the day in the sky, the boat moored up and gently bobbed around as a delicious dinner was served. 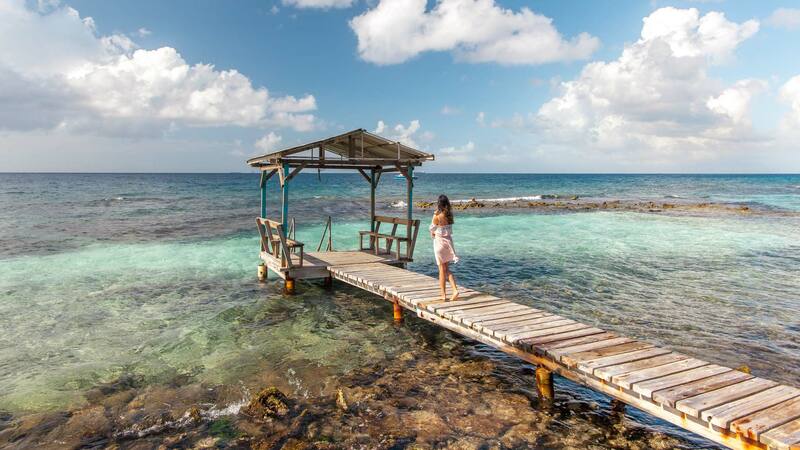 If you want a romantic treat on Aruba, this is one of the best options. Aruba is one of the few Carribean islands where the tap water is perfectly safe to drink, thanks to the huge desalination plant on the island. Obviously, apart from being an eyesore, this conjures up its own problems, but at least you do not need to buy a plastic water bottle on the island. Aruba is also banning all single-use plastics from 2019, and bringing in a ban on sunblocks which contain ingredients harmful to the reefs, so be sure to check the products you are bringing. For an island destination the single-use plastic ban is great, but be aware some of the ‘biodegradable’ plastic options aren’t much better as they take years to compost. At Eduardo’s beach shack, for example, they were more than happy to serve my bowl in a recycled paper container rather than the compostable plastic. Where to eat in Aruba? Local Store is a funky mix of retro wall colours and colourful lights. The menu is American with an Aruban twist (Balish BBQ ribs FTW), and the crowd is chilled with locals and some visitors. The range of Aruba beers here compliments the perfect chilled night out. Quinta del Carmen is an old hospital outhouse that has now been converted into a fancy restaurant. Whether you sit in the front garden, back terrace, or inside, the atmosphere is very relaxed while being higher end and the food is fantastic quality. Peanuts was a local recommendation, and the menu listed in Florian and the local customers confirmed that. 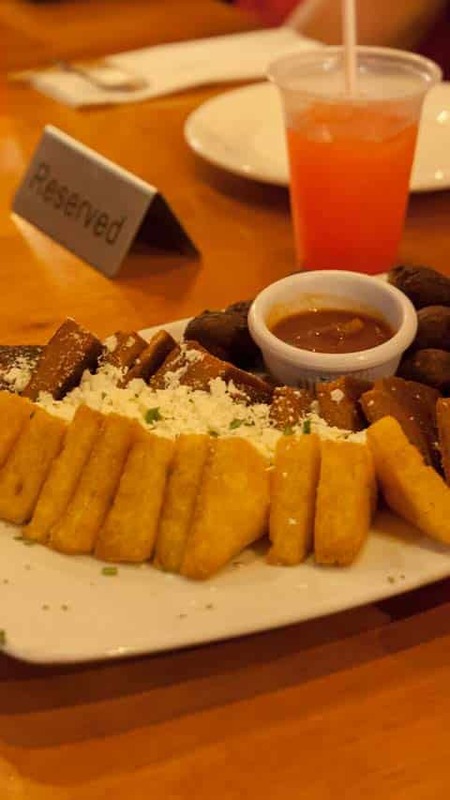 Here I sampled some Aruban stews and dishes and while the service was slow and the food not the best I had, the lower prices and laid back vibes reflected that. Hadicurari was a gem of a spot and is just north of Palm Beach. This good-vibe restaurant which spills out onto the beach means sand beneath your feet and the local Aruban cocktail in your hand. The Ceviche here was the standout dish for me. Zeerovers is a local joint, that has become very well known, but luckily, thanks to it’s slightly out of way location it hasn’t really become that touristy yet. For some of the freshest fish on the island, you can sometimes see the fishermen catching the fish from your table on their boats, head here. We also ate in some fantastic places in Oranjestad, and most of these were on the Aruba Walking Tour I talked about above, so I highly recommend joining that to sample some of the best dishes in the capital. Where to drink and party in Aruba? Craft is a small coffee house, come bar at night which can be found near the Palm Beach resorts. Serving some of the best coffee I found on the island, and excellent cocktails, it’s an ideal spot throughout the day. Gusto Nightclub is also in Palm Beach, and here was where I spent way too much money on G&Ts and danced like an idiot on the stage. Good vibes, a local crew and a good squad behind the bar. The Windmill is a pretty epic venue, though I’ll admit I don’t remember much by the time I got here. A late night spot a short walk from the Palm Beach hangouts, the outside club is flanked by the large windmill, imported from The Netherlands, which sits in the middle of the venue. 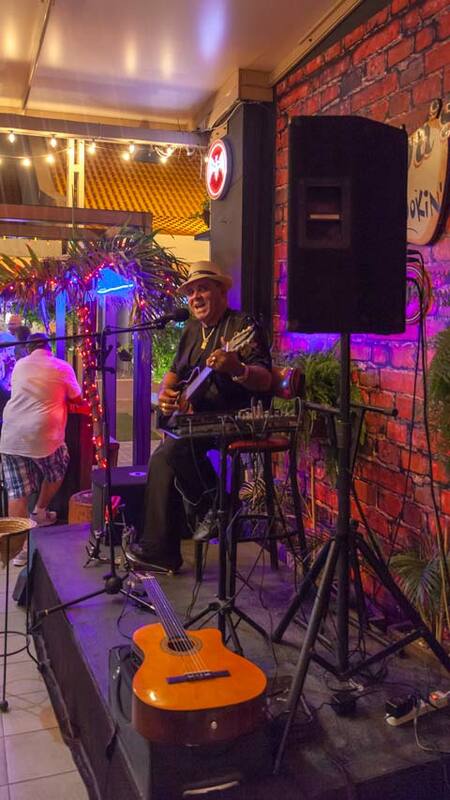 MooMba is another spot slightly north of Palm Beach and is especially popular on Sunday evenings when locals and visitors alike head here to enjoy the funky tunes and chilled local Balashi beer. I’ll round up my Aruba travel guide with some of the other things you can do on the island. As one of the premium Golf destinations in the Carribean, those who can handle the heat for a round can hit the courses here. If you enjoy your sports with a little more speed, then the islands Racing Track provides somewhere to put your foot down. If you want to enjoy an aerial view of Aruba, and it looked mighty fine when we came into land (tip: a seat on the left-hand side of the flight for landing provides the best views) then you have two options. Skydiving is a popular adrenaline option here, while helicopters and small planes provide scenic sightseeing flights and photography options. 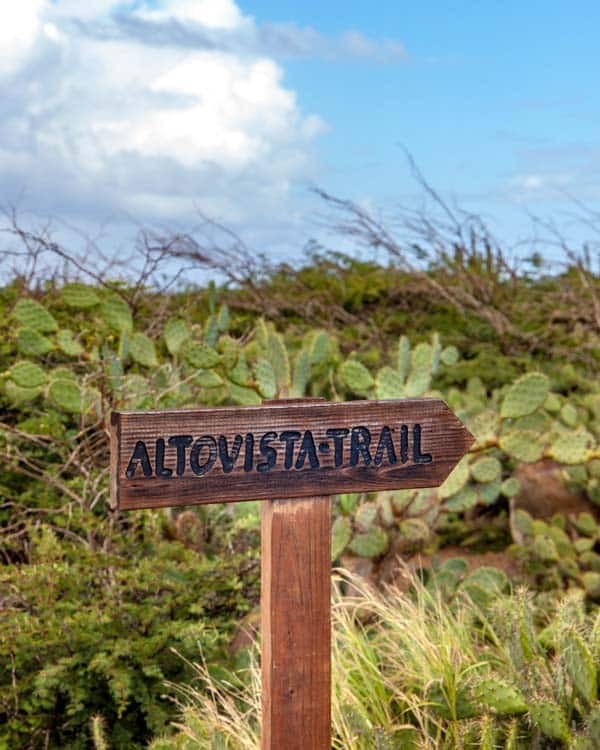 If you want to learn a little bit more about the island, then head to the Archaeological Museum which gives an insight into the geography, while a visit and tour of the Aloe Farm and Factory will help you understand more about one of the Islands most famous exports. The Aloe Farm isn’t far from the famed Butterfly garden, so these two can be easily combined. 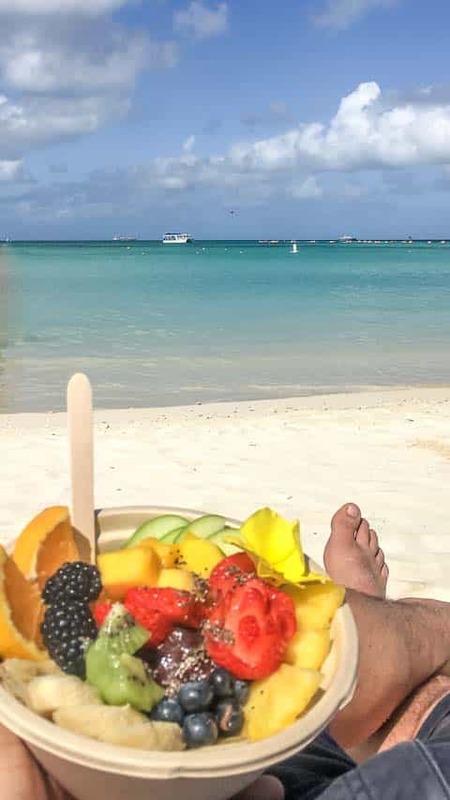 Whether you decide to spend your time in Aruba lounging on the beach or packed out with activities, I hope this Aruba travel guide has given you an insight into just how much there is to do on the one happy island and perhaps might convince you to make this your next stop in the Carribean! Love your blog!! May I ask what kind of camera did you use for your photos? I am not a professional photographer. I just wanted to look for a good camera for memories on future trips. BTW, I am going to Aruba in June for 1 whole week! Pictures and Blog is amazing Dan. I love your way of writing. Wow! Wow! and Simply Wow! Pictures are so beautiful. It seems you click the real beauty of the Aruba! Thanks for sharing with us. I want to see Aruba. Exotic place. Your article is inspiring. Thanks. It really can vary, as if you eat inland and away from the resorts and beaches it’s at least 70% cheaper I would, for the extra days I spent in Aruba this is what we were doing. With the car hire, you can also fill the days with free activities, or say a pass to the national park for less than $10. Accommodation will always be quite expensive on Aruba, but the rest of the costs really depend on how you want to travel! Thank you! Highly recommended Aruba, would love to return during Carnival proper! This is just so amazing Dan. Your photos are so wonderful. Thank you so much Agness! I want to go back for more diving! As always this blog is mindblowing.Recently,I watch a video that is “48 Hours in Cuenca,Spain”.I can’t explain you how much I like This Video.I also watched this article’s video it is also very amazing.I also like your articles and the style of your article writing It never bores a man.Anyway.Thanks for sharing. Thank you, appreciate you enjoying the videos especially! Antilles always looks like a paradise on the earth, but maybe a bit boring. Your article gives really interesting tips on what to do there and have fun. 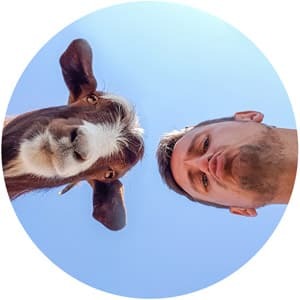 I really like your post. I subscribed, so I can be updated to your next articles. Wow, star gazing is fantastic. Great article Dan!